using diaspora documentary heritage in cultural communication, cinema, performances, art installations, creative industries. Candidates are expected to provide summaries of the proposed papers (100-150 words, up to 1500 characters) and entry forms by 31 March 2019 by e-mail to audrone.palioniene[at]pavb.lt. The candidates will be notified by conference organizers by 15 April 2019. The duration of presentation – 20 minutes, 5 minutes from which will be left for questions and discussion. 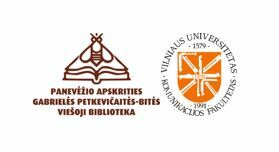 Articles based on the papers will be published in the special volume of Vilnius University peer-reviewed, open access and in Elsevier Scopus database reviewed scholarly journal „Knygotyra“ of the year 2020. We kindly draw your attention to the requirements for scholarly publications and bibliographic description, which can be found here: http://www.zurnalai.vu.lt/knygotyra/about/submissions . Deadline for submission of articles – October 2019. Organizers: Panevėžys County Gabrielė Petkevičaitė-Bitė Public Library; Vilnius University, Faculty of Communication. Partners: Documentary Heritage Research Department of Martynas Mažvydas National Library of Lithuania; Institute of Lithuanian Emigration of Vytautas Magnus University; Lithuanian Literature and Art Archive. Sponsor: Lithuanian Council for Culture.